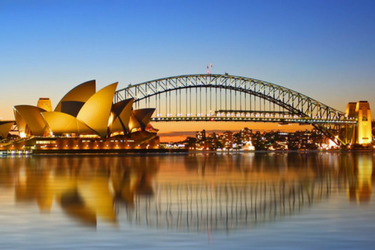 To celebrate the largest sporting event in 2014, TLC Marketing and Sony Mobile Communications Australia, along with Optus Australia have teamed up, fuelling football fever across Australia. 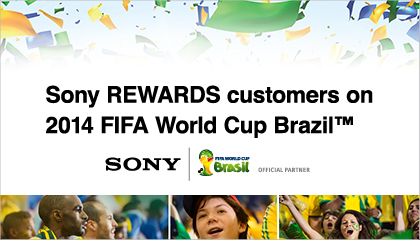 In April 2014, Sony Mobile Communications launched a TLC ‘Xperia™ E1 Adidas World Cup Campaign’ rewarding the purchase of a new Xperia™ E1 handset with the official Brazuca match ball replica of the 2014 FIFA World Cup. 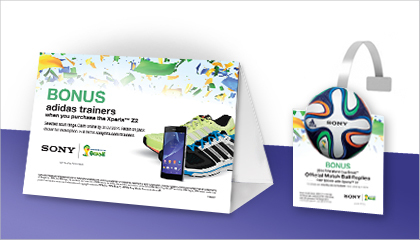 This campaign was closely followed n May 2014, with the launch of the ‘Xperia™ Z2 Optus Campaign’ rewarding consumers on the purchase of a new Xperia™ Z2 handset with a Bonus pair of Adidas Trainers valued at $190. 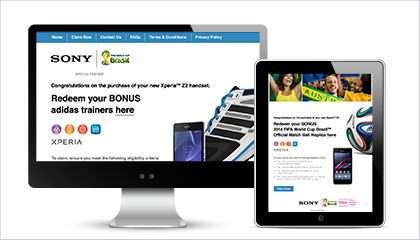 This exclusive TLC Marketing and Sony Mobile Communications campaign was available to consumers via online redemption, supported with on-pack and in-store point of sale collateral.